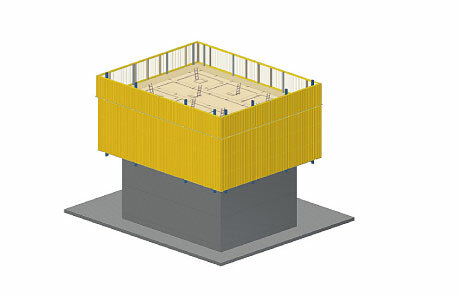 The Platform SCP has room for all the site equipment needed, and is enclosed on all sides for safe, weather-shielded working, even at great heights. Powerful hydraulic cylinders cranelessly raise the platform, formwork, equipment containers and concrete placing boom to the next casting section, in only one lift. 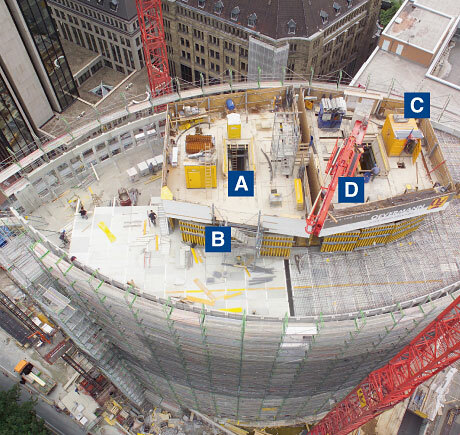 In this construction method, the core zone (lift shafts, stairwells) climbs ahead of the floor-slabs. 'De-linking' the different building components in this way speeds up work, while providing excellent protection against the weather. 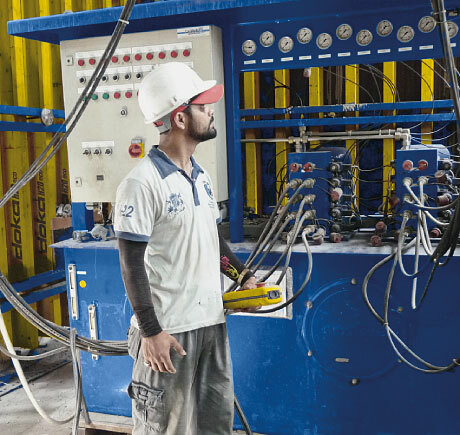 In this construction method, the floor-slabs and walls are cast in one single pour – this makes for high cost-efficiency and speeds up construction progress still further. The high service loads that are possible on the Platform SCP save storage space on the site at ground level. For even faster cycle times, the reinforcement operations can also be carried out above the platform. The system makes it possible to suspend working platforms that reach deep down into the shafts, enabling the crew to start carrying out finishing-jobs while the concreting works are still underway. (C) Equipment and tool containers can easily be installed. This optimises the infrastructure. 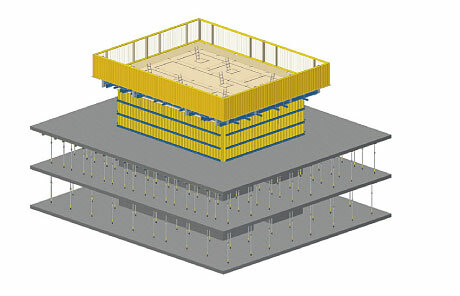 (D) A concrete placing boom can be integrated into the formwork concept, and raised with the Platform SCP. 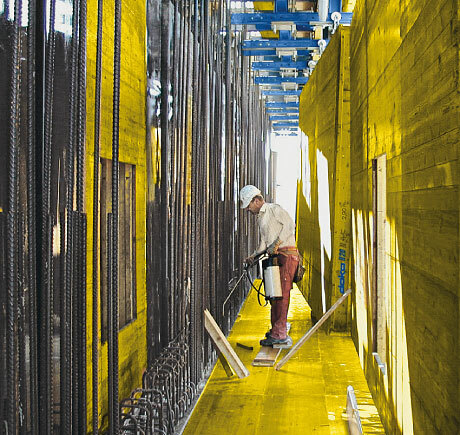 Together with the working platform, timber-beam or framed formworks are raised to the next casting section in a single lift, by powerful hydraulic cylinders. The generous striking-distances and ingenious platform system permit "Safe. Fast. Efficient." working, just like on the ground. Thank you for your interest - Platform SCP. Thank you very much for your interest - Platform SCP.